This week I was pleased to see that the Vatican has released a document discussing the matter of bio-ethics. The document is very clear in presenting our tradition of ethical teaching and is based on the sacredness and dignity of human life. It is timely because, with all of today’s new technology, many people are confused. This confusion was one reason why, when I was the bishop of Fall River, I wrote in 2001 my own pastoral letter on in vitro-fertilization. Many good Catholics are unaware of the implications of these new technologies that are ultimately about destroying human life. I encourage all of you to take the time to read this very important document. 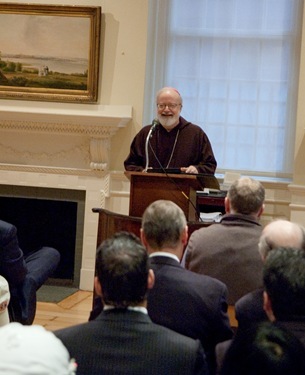 Last Thursday, I spoke at one of our regular gatherings at the Old State House called “Christ Speaks in the City” sponsored by our Vocations Office. They asked me to speak on the theme of St. Paul and we had a very nice turnout of office workers and other people from the downtown area. They put out a nice lunch for those who came and afterwards there was an interesting question and answer period. We are in the middle of the Pauline Year, which the Holy Father designated to mark the 2000th anniversary of St. Paul’s birth. This talk is just one of our activities to recognize that reality and to reflect on the life, works and importance of St. Paul and our missionary Church. The Pauline Year continues until June 29, the Feast of Sts. Peter and Paul. You can read more about the talk here. 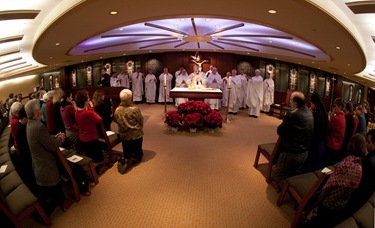 That evening we had an Advent Mass and a gathering for the staff at the Pastoral Center. 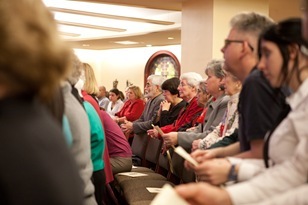 It was wonderful to see the chapel filled with so many people participating in the Eucharist. At the reception, I was glad to see people enjoying themselves in the spirit of preparing for Christmas. 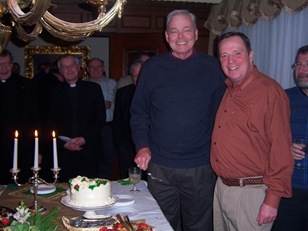 We also took advantage of the event to bid farewell to longtime members of the staff who are leaving. The longest serving staffer leaving is my own secretary, Kaye Woodward, who has been with the archdiocese for 35 years. Also Friday, Father Kevin O’Leary, the rector of the cathedral, organized a Mass and get together of the priests in our vicariate. It was wonderful to be able to bring these priests together in one place for fellowship and to share the spirit of Advent. 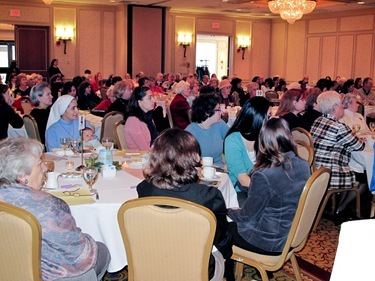 Women Affirming Life hosted their annual Mass and breakfast Saturday at the Newton Marriott. I was happy to be able to celebrate Mass and share the breakfast with them. There was a great turnout with many women there attending for the first time, including many young women from local colleges and universities. It was very encouraging to see the commitment of these women to the Gospel of Life. Women Affirming Life continues to grow because of the hard work of Mary Ann Rossini, Fran Hogan, and so many others. 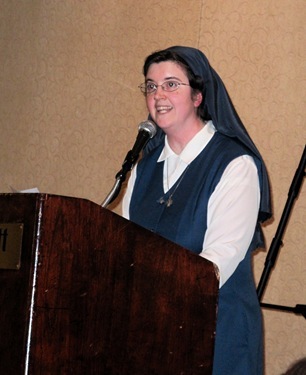 One of the speakers at the breakfast was Sister Kathryn James Hermes Natal, a daughter of St. Paul, who presented a slide show on Life. All in all, the whole event was very well done. I am very eager to encourage the women from the Pro-Life Office, led by Marianne Luthin, in the excellent work they do. You can read more in an article published in this week’s Pilot. Sunday, I made a pastoral visit to Our Lady Comforter of the Afflicted in Waltham, where I celebrated the Mass for Gaudete Sunday and met with the parishioners at the reception after the Mass. The pastor, Father Jim DiPerri, is doing a very fine job there. 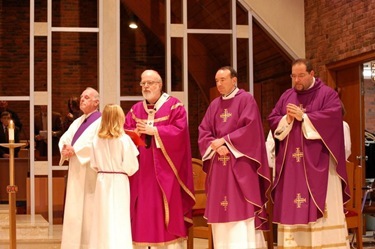 The parish is a very active community with an excellent choir, many young families, a thriving school and CCD program. Monday, I attended the board of trustees meeting at the Catholic University of America in Washington. 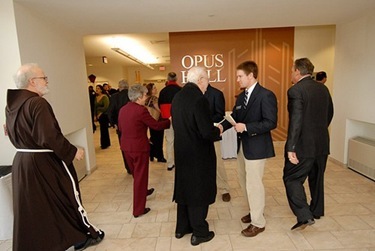 While I was there, they dedicated the university’s new Opus Hall. It is a seven-story building, which is now the tallest building on campus. Among other things, it will be used for dorms for up to 400 students. The hall stands as one of the outstanding accomplishments of Father David O’Connell’s leadership. 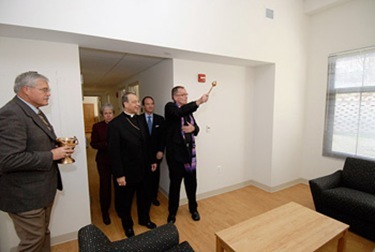 Father O’Connell said at the ribbon cutting he is committed to building up the stature of CUA while remaining grounded in the ideals and values of the Catholic faith. 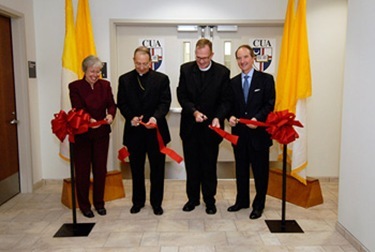 Here are some photos of the dedication from CUA’s web site. 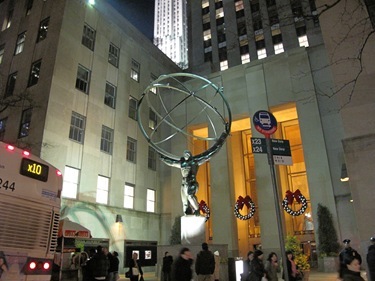 You can read much more about the dedication and the building itself here. 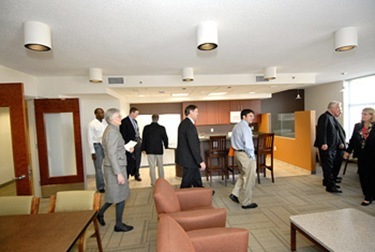 Opus Hall was funded with a $3 million gift from Neil J. Rauenhorst, his wife, Becky, and the Opus Group. The Opus Group also funds the foundation that sponsors the annual Opus Prize, a “cannon shot” service award that comes with $1 million payment, which is intended to give the winner the resources and high-profile recognition to advance their humanitarian mission. There are also two $100,000 prizes awarded annually, as well. 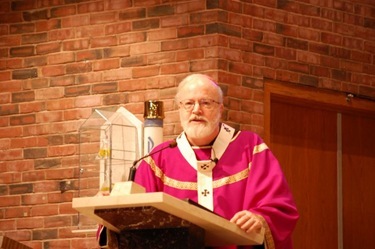 To further encourage a culture of service, the foundation has partnered with Catholic colleges, such as Notre Dame University, Seattle University, Marquette University, the University of San Francisco and the Catholic University of America and members of those communities participate in the selection process. The schools also incorporate the lessons and examples of the prize winners into the student curricula. In this way, young Catholics about to enter adult life are exposed to extraordinary missionaries and others dedicated to serving the poor. The foundation selects a new college partner every year, the 2009 partner will be St. Thomas University in St. Paul, Minnesota. 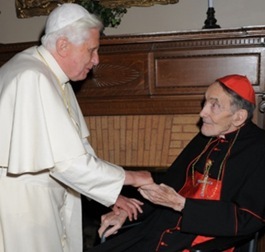 Finally, I want to speak again about my good friend Cardinal Avery Dulles, who passed to the Lord last week. 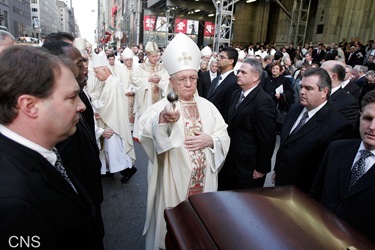 Thursday, I concelebrated at his funeral Mass at St. Patrick’s Cathedral in New York. The diversity of the mourners was a testament to the many lives he touched. 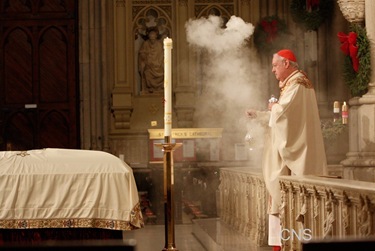 The Holy Father entrusted Cardinal Egan to represent him at the Funeral. 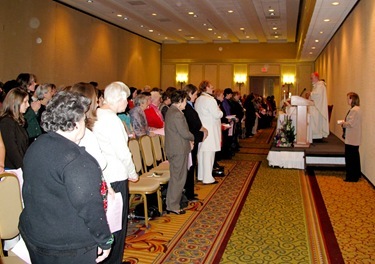 Both the Nuncio to the United States and the Nuncio to the United Nations were present and joined with over one hundred bishops and many priests. During communion the choir sang a beautiful melody of the Prayer of St. Ignatius which I had not heard before. it was captivating. I don’t have a recording of the melody, but I want to share the text of the prayer with you. Thine was the gift, to thee I all resign. Do what thou wilt, command and I obey. Possessing these; all riches I forego. 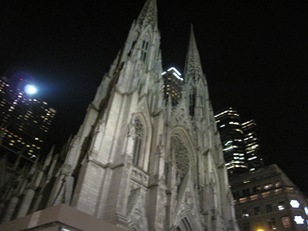 As you may know, St. Patrick’s Cathedral is on Fifth Avenue, across the street from Rockefeller Center. 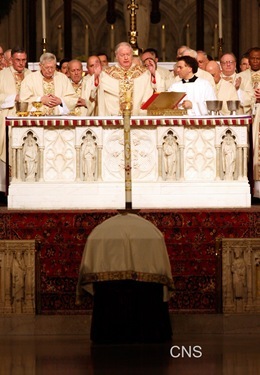 At the end of the Mass, the central doors at St. Patrick were opened so the casket could be brought out of the cathedral for the final part of the liturgy. All the bishops and priests came out the same way and, as we were approaching the entrance, we could see the statue of Atlas holding the heavens, which directly faces the Cathedral. It was a moving moment to see the kneeling giant, as we were about to give our last farewell to Cardinal Dulles. 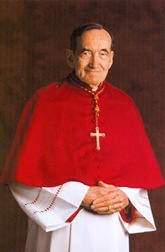 Cardinal Dulles was one of the most renowned American theologians and his was a great service to the Church. 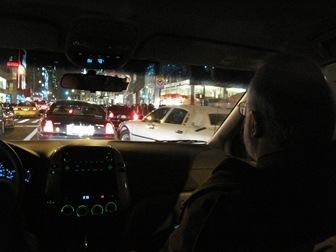 St. Francis at one point says the theologian ministers to us spirit and life. But, unfortunately, sometimes theologians are not faithful to their mission and then become teachers of their own doctrine, rather than that of the Church of Christ. But in Avery Dulles, we have a man who was thoroughly motivated by his faith and fidelity, and who put his great intellectual capacity at the service of truth and the service of evangelization. It was truly my privilege to have known him for the many years he was with us in Washington. 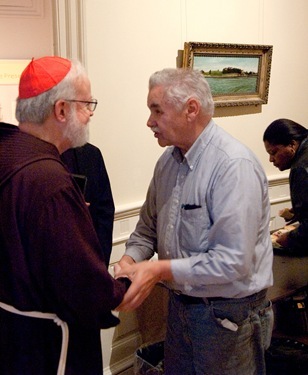 We were also blessed to have had heard him speak at St. John’s Seminary. Following the Mass, Fifth Avenue was bursting with people and shops were decorated in anticipation of the Christmas Season. 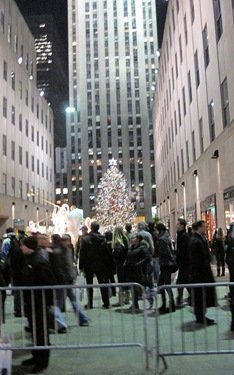 If I happen to be in New York during Advent, I always like to see the Christmas tree at the Rockefeller Center. I thought I would not see it this year, but after the funeral we drove by it. I could only see it a split second because a bus stopped in front of us, but we could at least take a photo of it! 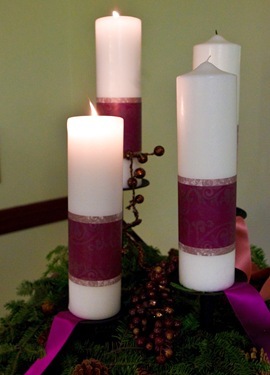 As we prepare to enter this final week of Advent and look forward to the celebration of the birth of our Savior, let us all open our hearts and prepare a place for Him! 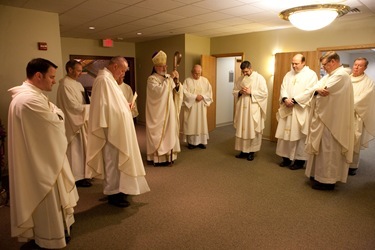 a friend of mine–who has served Mass with you for years at the National Shrine bestows a great honor, noting your simplicity, which I have also seen in Cardinal Dulles–this spiritual gift of God, one I have tried to cultivate, but know I am very short and for which I pray–to Bl. Mother Emilie Gamelin, my order’s foundress, herself a simple woman–dear Cardinal, to become less duplicitous and more simple–please pray for me to the Lord, I humbly ask you… and in return, I add YOU to my daily intentions. I know I am but a little child in God’s eyes… oh, that it be that way in mine!